We previously showed that the morphogen Sonic hedgehog (Shh) upregulates the expression of a positive regulator of the G2/M transition, the CDC25B phosphatase, together with the onset of neurogenesis (Benazeraf et al., 2006). We identified the functional relevance of this upregulation of CDC25B in neural progenitors (Peco et al., 2012). CDC25B expression is present in a subset of proliferating neural progenitors correlating with areas where neurogenesis occurs. 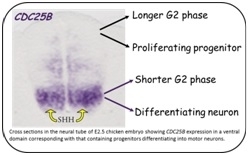 Neural progenitors expressing CDC25B display a shorter G2 phase than those that do not express this phosphatase. Knocking down CDC25B using a RNAi-based method results in a specific lengthening of the G2 phase, without significant modification of the S-phase length and the total cell cycle time. This modification of cell cycle kinetics is associated with a reduction in neuron production that is due to the altered conversion of proliferating neural progenitor cells to post-mitotic neurons. These data indicate that CDC25B has two functions in neural progenitors: to change G2-phase length and to promote neuron production. We thus identified the CDC25B phosphatase as a new actor governing the balance between progenitor cells maintenance and differentiation (Peco et al., 2012). We are currently deciphering the cellular and molecular events by which the CDC25B phosphatase switches a proliferating neural progenitor into a differentiating neuron. To help us accomplish this goal we recently set up a novel high resolution time-lapse imaging technique that allows measuring the duration of each phase of the cell cycle in single neural progenitors in the chicken developing neural tube and to track the fate of daughter cells after mitosis. Following this approach it is then possible to identify the cell cycle kinetics of self-renewing progenitors versus neuron-generating divisions and, combined with gain and loss of function experiments, to determine how modifications in cell cycle dynamics impact cell fate decision. These innovative dynamic analyses of the cell cycle will allow us to precisely elucidate the role that cell cycle variations have on the mode of division. 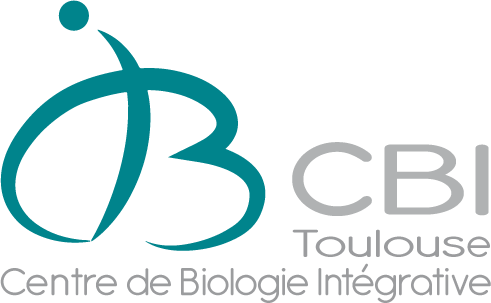 We will implement them with molecular studies to better understand how cell cycle dynamics integrate into molecular networks orchestrating cell fate decision. We thereby expect to uncover a novel mechanism controlling the transition between neural stem/progenitor cells maintenance and differentiation which most likely will be applicable to other stem cells including human neural stem cells.